The good thing is that the properties that are used in BIRT are defined someplace in the Java code. The hard part is finding exactly where the definition has been placed. I have created a crib sheet with the classes that contain the most common property names on the wiki. You can take a look here . If you have been working with the BIRT APIs and have found similar information that might be useful, please feel free to update the wiki with your hints. To illustrate modifying a BIRT chart at runtime, assume we have a bar chart that we wish to add additional line series to, based on some report parameter. This can be accomplished by creating an event handler for the beforeFactory event and modifying the report prior to it running. Now that we have the actual chart model, we can use standard chart engine API calls to modify it prior to the report running. Remember to import the CE API packages prior to using them. See the final example for more details. 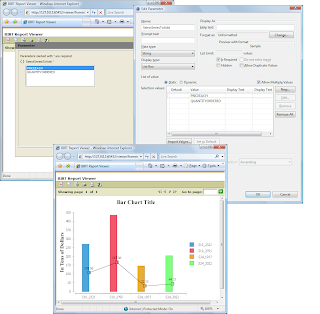 Since we have a bar chart, the chart model will be an instance of the ChartWithAxesImpl class. This class has methods for getting the chart axes and adding series definitions. If we define a static report parameter that allows multi-selection, with values that correspond to the row values we want to map with line series, the following code will add the appropriate series. The for-loop iterates over the selected values within the parameter and creates a Line series for each value. The value of each parameter is used as the query for the new series. Finally the new series definition is added to the first y axis. The complete example is located here.